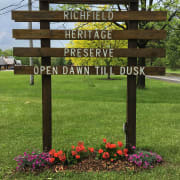 Richfield Heritage Preserve needs your time, talent, and energy to help keep the park beautiful, clean, and safe for all to enjoy! Please join us on Saturday from 9 am - 12 noon, to undertake projects and tasks that are essential to preserve, maintain, and improve the park. Email us a few days ahead at volunteer-info@rjrd.org or call 330/888-0511 to make sure there's a project on a given Saturday.